It’s no big secret that I love vintage crafts. Dose not really matter which holiday or medium as long as it is kitschy I’m there. 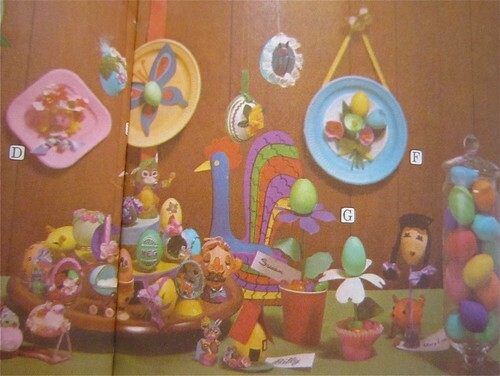 I thought to get us both in the Easter mood I would do a 3 part round-up of some of the best vintage Easter crafts I could find. 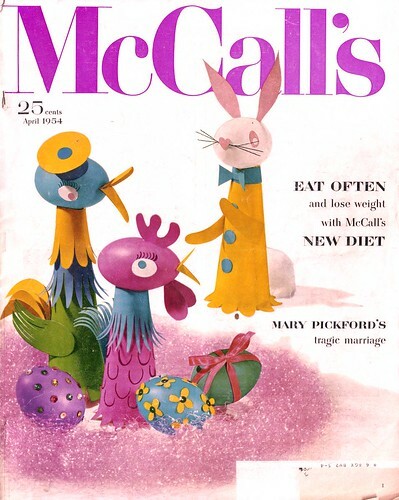 I have a pretty extensive collection of craft books and magazines and also found some treasures online like this April 1954 copy of McCalls kindly uploaded to Flickr by Paula Wirth. 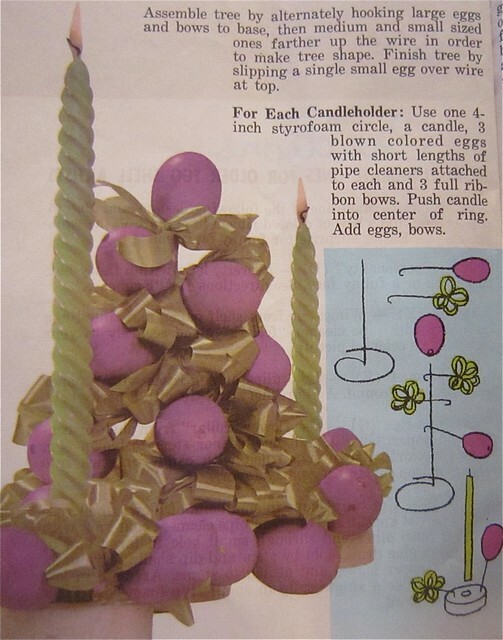 If dying Easter Eggs is the extent of your Easter crafts, get ready to have your mind blown. 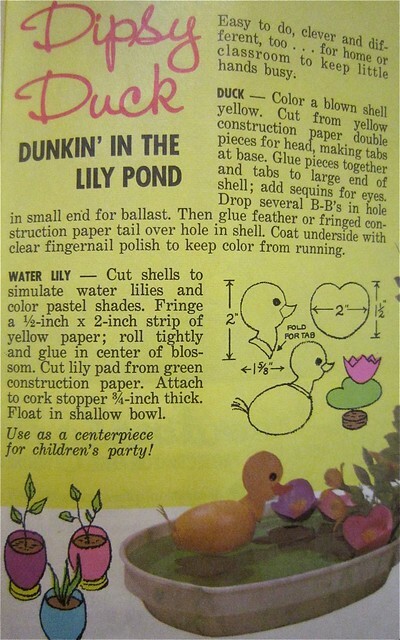 Once upon a time I scored a vintage Paas Easter Egg Decorating & Party Ideas booklet. This baby is chocked full of crafty Easter goodness. 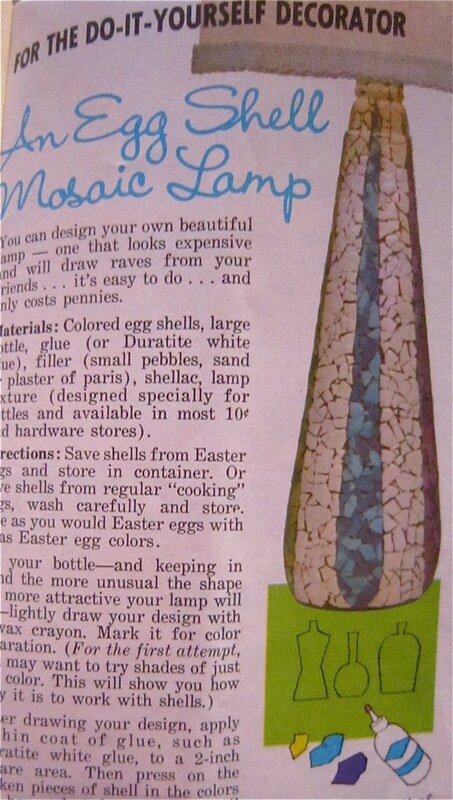 I think the little floating Dipsy Duck is my favorite with the mosaic lamp a close second. The lamp was inspiration behind the Easter Eggshell Earrings I made last year. When I saw these bleach bottle bunnies on Pinkytoast I was green with envy. What a mega score! Not days later flipping through an April 1974 copy of Pack-o-Fun I saw an ad for the mail order kit. Talk about adding insult to injury. Maybe one day I will find or make my own set. A girl can hope and dream right? 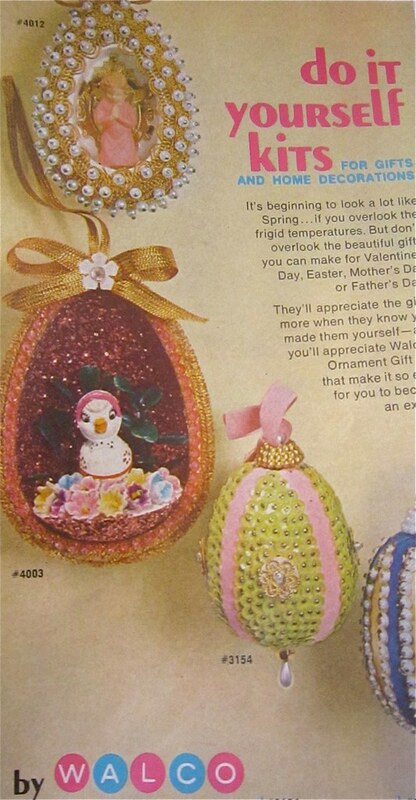 I already have a large collection of vintage sequined fruit, seems like a collection of these tack-a-liscious eggs would feel right at home around here. I especially adore the ones with little cut outs and figurines peeking out from inside. 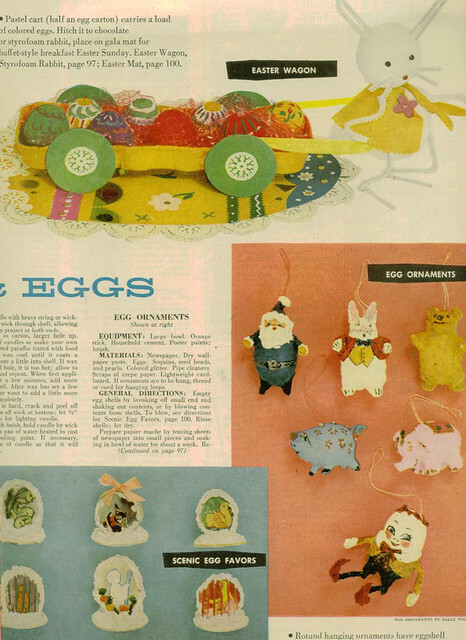 Thank you Camp Smartypants for uploading this array of vintage Easter craftiness. 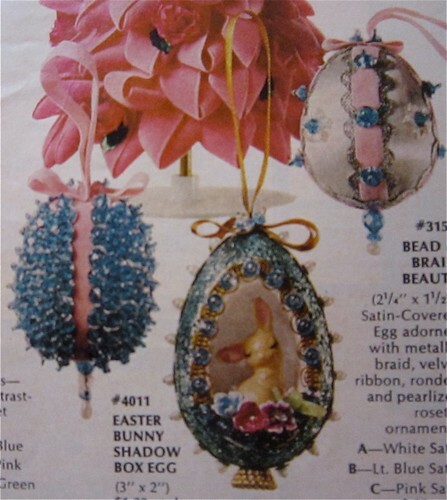 Ornaments, Wagons and Favors – it’s enough to make me want to throw an Easter Party. 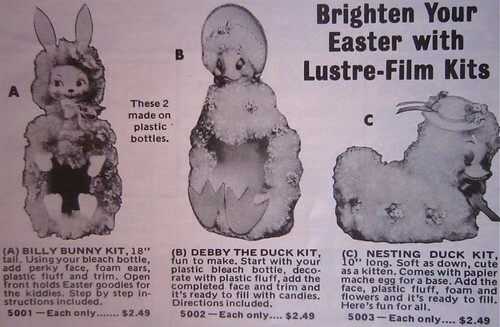 Do you have any fond Easter craft memories? I can smell the vinegar and see the little Paas tablets fizzing in a coffee mug in my grandma’s kitchen every time I think about Easter. Ahhh fond memories. Posted April 6, 2011 & filed under Crafty, Easter. Great reminder that its time to get my Easter goodies out! I like that Dipsy Duck thang too! I had to giggle over the the mail ad comment….cuz' many the time have I wished for a time machine ….not to prevent a great catastrophe….but..to order groovy big eyed girl art or Mexican embroidered blouses from the back of my vintage Seventeen mags! when I was in school we used to have an egg decorating comp…I went a little crazy and made mine into an "Art Eggsibition" or however you would spell that! I actually won too 😛 I love these vintage crafts…..even just to look at they are cool! !